I had one of our customers ask me one time how much to charge to clean the face of the gutters when washing a house. I said that if you were washing my house I would expect it to be included in the price. As you can see in the Picture it can make a dramatic difference in the appearance. They may not notice that you did it but they will most likely notice if you didn’t. So how do you get these results? The trick is to use a butyl based degreaser. We sell Viper Venom. These types of chemicals remove oils at a lower pH then other degreasers. The crud that you are removing is mostly residue from the asphalt shingle. In the summer time the asphalt gets soft and then a sudden rain storm will carry some of it off the roof. The lower pH will remove the oils and leave the paint most times. Paint strippers are typically a higher pH product that will break down paint. 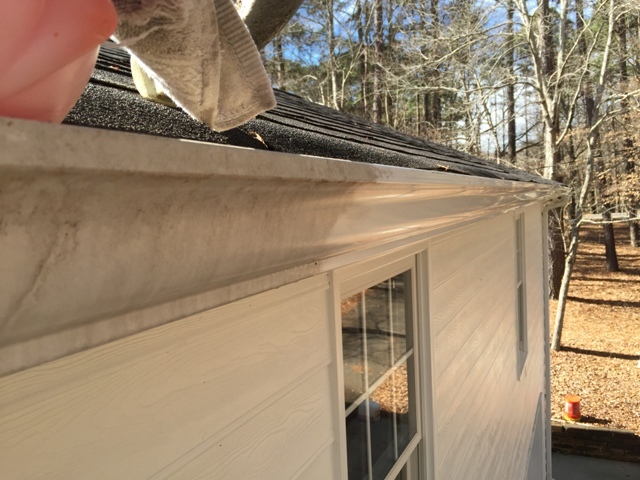 So without butyl you may take the paint off the gutters. So build a little into the price to leave the house looking great so you can get the business next year. It is imperative to keep good records on your customers so you don’t have to start from zero every spring. Outlook or even a small cloud based CRM like Sales Optima will allow you to email or remind you to call all of your customers to get booked early in the year. Cloud based CRM’s allow you to store more data like Before and after pictures for each customer as well as several contacts, maps and special needs like dogs out back.